Like most people, when the new year rolls around, I like to take a little time out and reflect on the year that was, and the year that is ahead of us. With real estate, I’m a little hesitant trying to predict what will happen in our local market over the next 12 months. But I can certainly take a look at what has happened, not only last year, but maybe even stretching a little further back than 2014. For the entire Louisville MLS, which includes several neighboring counties adjoining Jefferson, such as Shelby and Oldham counties, 2014 was the third year in a row that saw a rise in the number of units sold when compared to the preceding 12 months. 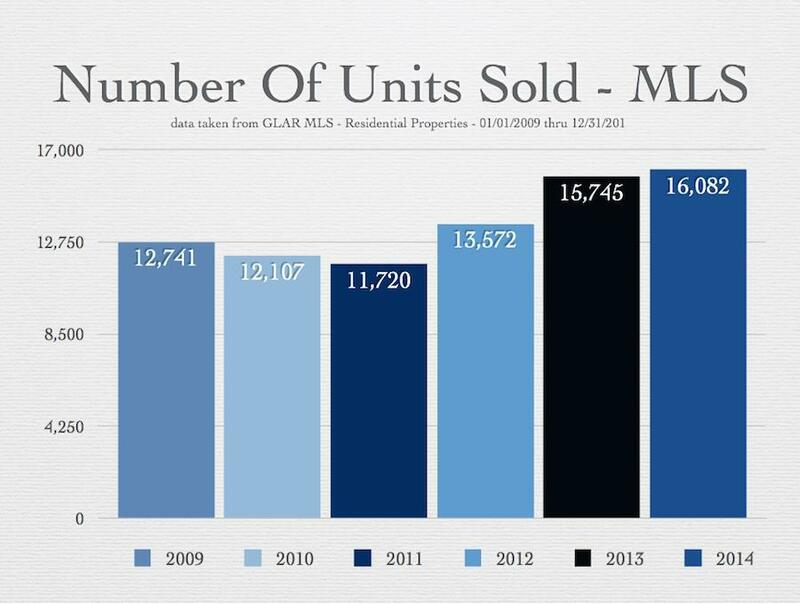 From a recent low of 11,720 units sold in 2011, each of the next three years saw a few more sales to reach this past year’s total of 16,082 sold properties. I have seen different numbers being reported, with some outlets even saying that the MLS saw a decline in the number of homes sold between 2014 and 2013. So to clear up any confusion and to be fully transparent, all of the numbers that I used for these graphs were pulled directly from the MLS, and included all single family homes along with multi-family properties, rentals and vacant land or lots. I chose to use all the categories of residential sales, and not focus on single family homes only because I wanted this short article to be general in nature, and to be all inclusive since I don’t know which types of properties each reader might find most interesting. When I turned the tables and focused on how well Kentucky Select Properties has fared as a Brokerage over the past few years, I used the exact same criteria. As Kentucky Select Properties celebrated its 10th Anniversary (thank you!) this year, the numbers appear to show that the word is spreading, and that our company is helping more and more buyers and sellers move forward with their life by handling what is likely to be one of their largest financial transactions that they will ever undertake. Since 2009, we have seen 5 continuous years of growth and last year was no exception. Even in the years that the MLS was shrinking, between 2009 and 2011, our company was expanding. In fact, not only has Kentucky Select Properties grown, but the number of transactions we were involved in more than doubled between 2009 and 2014! Another way to look at the past five or six years is to consider that the MLS sold just over 26% more homes in 2014 than in 2009. That’s not horrible. Maybe it’s not great, but it sure beats some of the other markets around the country that are seeing declines in total sales instead. 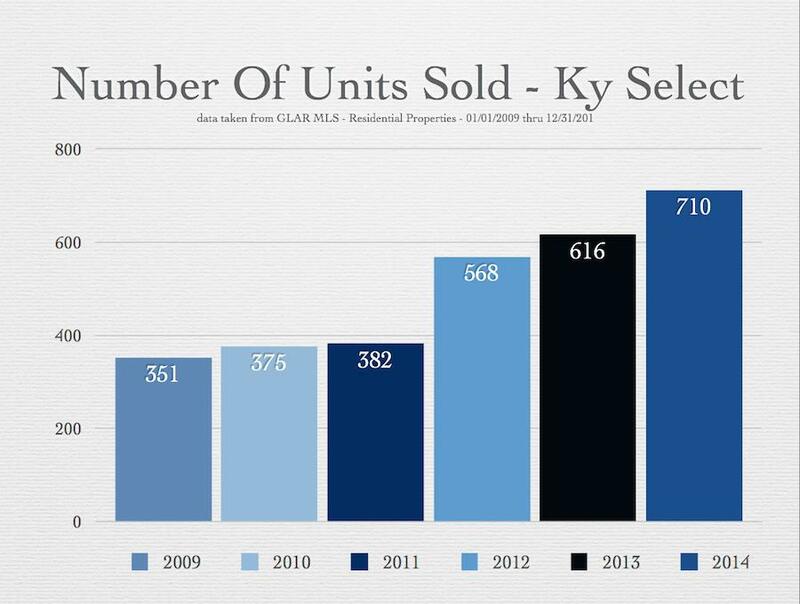 While the MLS rose 26% in the number of properties sold, Ky Select was busy selling 102% more homes! That is a huge number of individuals and families placing their trust in us, and we aim to meet that obligation with a level of service and professionalism unsurpassed in the local marketplace. As we say goodbye to last year, and look forward to 2015, please know that we are grateful for the faith and trust that you have placed in Kentucky Select Properties, and know that we will continue to work as hard as possible to continue our streak of outperforming the local market. Moving forward, please keep an eye out for future updates on our local market. Some updates may be focused on different zip codes and get quite narrow in scope, and others may focus on different price ranges, such as high-end home sales or maybe even million dollar sales. So if there is a graph you want to see, or some numbers you need crunched, please let us know, and I’ll be happy to start digging into more MLS data!